Look at this humungous event! Five prizes, 5 winners! Which would you love to win? I would love any of the five! This Giveaway Event is so ExCiting, I couldn't wait to spring it open. I can see my children and grandchildren already playing on these in fact there is even one my parents would enjoy! It would be an awesome Thank You for all the reviews they do or help with. So what do you say - Win it and send it to me?!? No? Well that is o.k. because it was put together for all you fabulous readers so having said that - GOOD LUCK ALL! Your little ones will love to get their bounce on in the Skywalker Trampolines 5-ft. Seaside Adventure Bouncer, which features a fun ocean theme and excellent bouncing capability. This fun bouncer offers a steel frame construction, woven jump mat with numbers, dual zipper enclosure. It's recommended for children 6-8 years of age and has a weight capacity of up to 100-pounds. Kids will love to jump and play as the secure elastic stretch bands provide bouncing fun. Easy to set up, this Intex 10' x 30" Metal Frame Pool is supported by strong, durable steel frames, which are powder coated for rust resistance and beauty. Triple strong, super-tough laminated sidewalls of the Intex Metal Frame Swimming Pool are reinforced with an all-around band to keep frame legs firmly in place. For clean, refreshing water, connect the new economical and environmentally friendly Krystal Clear Cartridge Filter Pump. The Ground Fault Circuit Interrupter is an added safety feature that shuts off the pump if electrical current is exposed to water. The Glenmeadow 6-Piece Patio Dining Set comes with four chairs that fold flat for storage, a glass-top table and an umbrella that is easy to open and close. This patio dining set with umbrella is covered in 100-percent outdoor furniture sling fabric that is UV-rated fade-resistant and constructed of durable, powder-coated steel. Each chair of this patio dining set with umbrella holds up to 200 lbs and comes with a safety lock feature. The table is tempered glass and scratch resistant. Your folding dining set cleans easily with soap and water. The Flexible Flyer Swing Free Metal Swing Set will provide backyard fun all summer long. This swing set allows your kids to play and get some exercise at the same time. It comes with four different activities that can keep up to six kids busy and active. The sturdy, steel frame of this backyard swing set is built to last and can have parents feeling confident that their kids are safe. The swings, trapeze swing, air glider and slide provide plenty of opportunities for outdoor fun. Five lucky people will win! 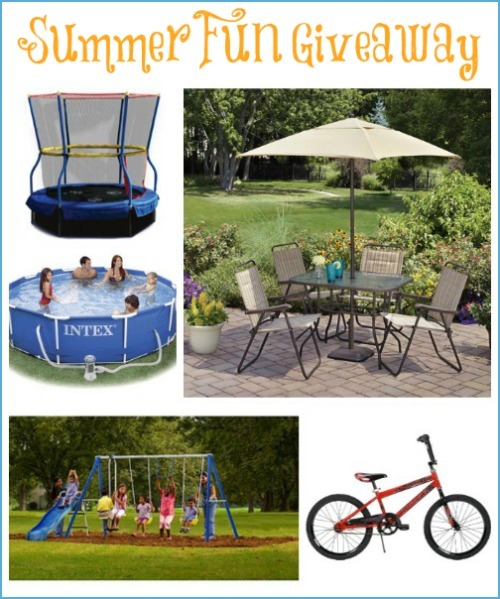 Each receiving one of the following: Skywalker Bounce-N-Learn Trampoline, Intex 10' x 30" Metal Frame Swimming Pool, Glenmeadow 6-Piece Folding Patio Dining Set with Umbrella, Flexible Flyer Swing Free Metal Swing Set & 20" Huffy Rock It Boys' Bike! Giveaway ends June 24th at 11:59pm, open to US residents, ages 18+. To enter please use the Rafflecopter form below. Good luck. href="mailto:teri@mompoweredmedia.com" target="_blank">teri@mompoweredmedia.com with questions or to see your business or blog featured on the next big event! Swimming is always great at our beautiful lakes!